Located on the west bank of the Tiber River and south of Vatican City, Trastevere has a spirited medieval old-town feel. Greenwich Village in New York came to mind as I slowly made my way through the tightly winding streets. 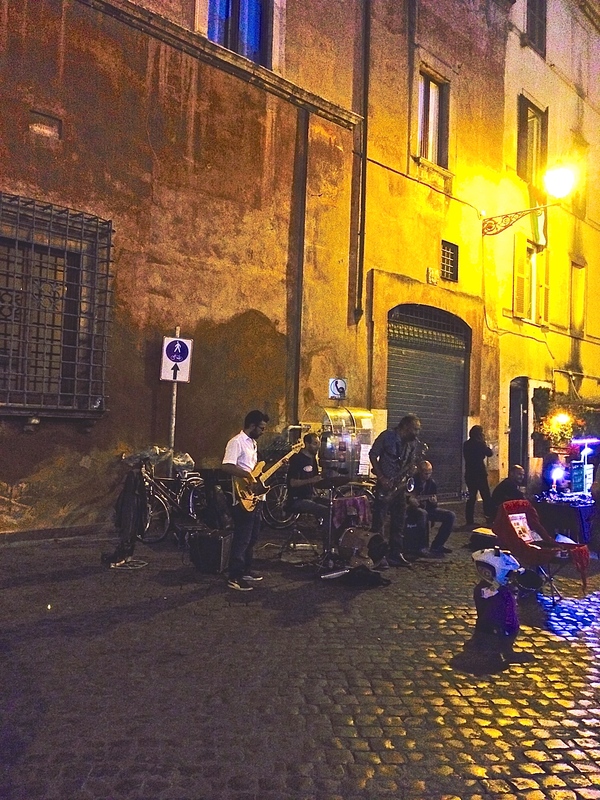 Quaint, comfortable, charming, incredible nightlife….Trastevere is all of these and more. 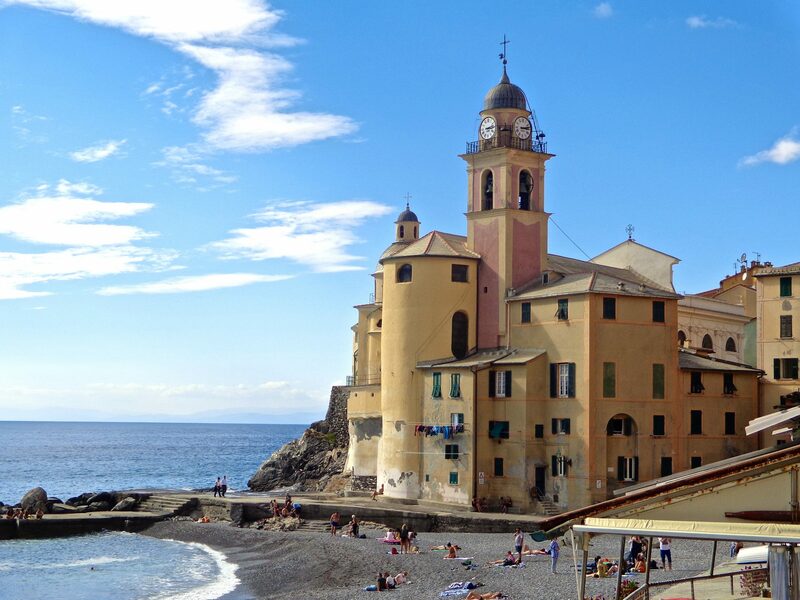 I had been invited to be a part of a blog tour team with the mission of discovering, experiencing, and sharing with my readers a bit of insight about some of Italy’s most fascinating destinations. 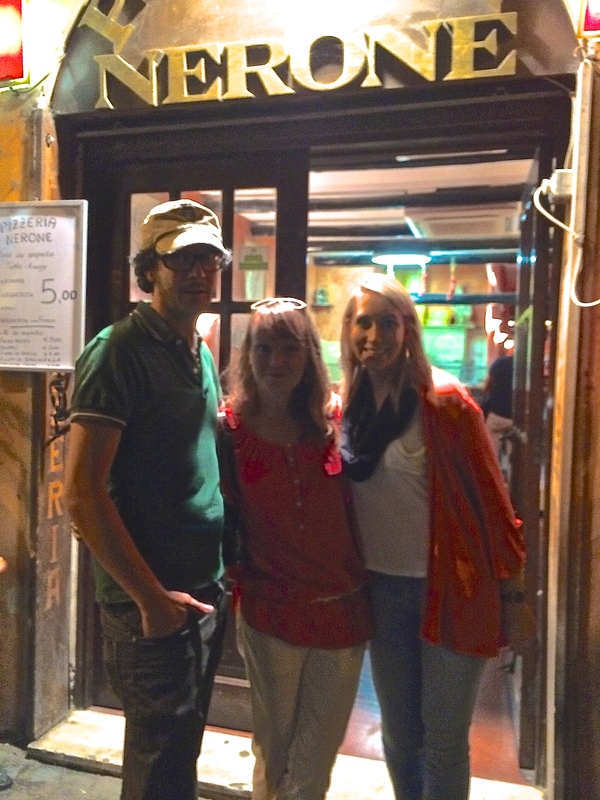 Helena, one of the tour members who lives in Rome, had picked me up previously at my room in Guesthouse Sant’Angelo. 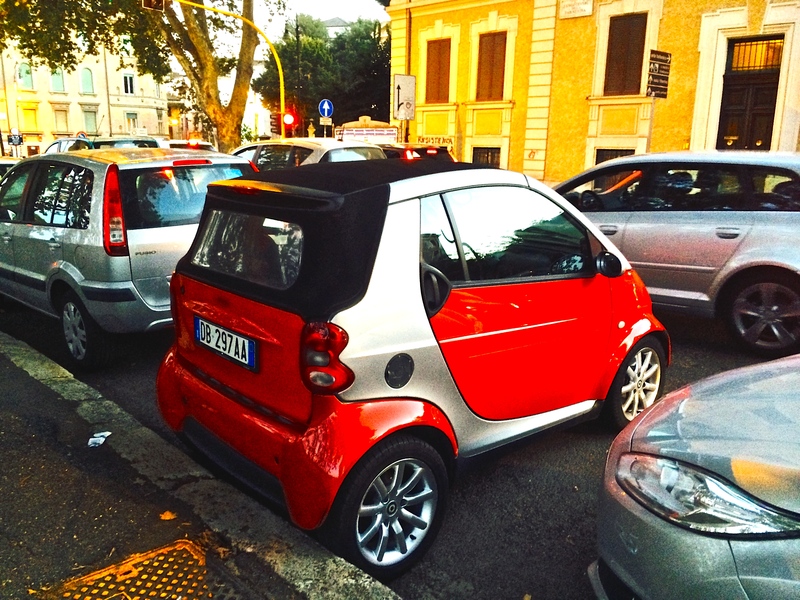 We followed the Tiber River south and found the tiniest parking spot imaginable. It was no problem for Helena. Like a pro, she backed her little Smart right up to the curb. Since I had never parked like this before, I was quite impressed. Bars, nightclubs, trattorias and pizzerias hummed with groups of people engaged in lively conversations. A golden glow brushed the cobbled streets and reflected off old brick and stucco walls. Aromas of savory food filled the air as soft guitar music could be faintly heard over the drone of voices. Diners packed around outdoor tables for aperitif or dinner. There were so many excellent selections to choose from its difficult to go wrong. I noticed that while enjoying the ambiance at a table, the desire to linger only grows stronger. Helena and I found the others on the stairs of a small fountain and headed for their favorite pizzeria. We passed a couple of small bands strumming guitars and softly singing. Their presence brought a romantic mood to the festive atmosphere. Pizzeria Nerone was an excellent choice for delicious pizza and salad. Watch the one minute video by clicking on the name. You will see the immense and savory looking individual pizzas made for each person as well as how they make them. To my amazement, I ate the whole thing! Except for the bread. It was as tasty as it appeared, however huge. Everyone at my table had a good laugh and took photos. The Chianti wine was a great addition. After dinner, we took a stroll through the piazza and up to the 12th-century Basilica di Santa Maria. The silhouette of the archways, as well as the statues in front of the mosaic of Mary and Jesus, flanked by 10 women holding lamps, was a beautiful sight. I entered the portico and snapped a photo of the piazza through the iron rod gate, amazed at the two completely different atmospheres. 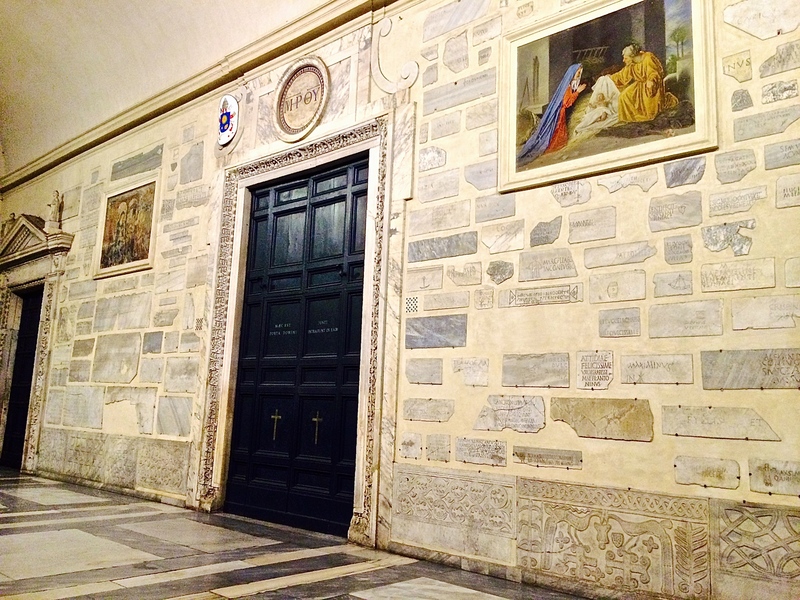 Inside the portico, the walls are packed with sections of ancient marble and Latin inscriptions. These are pieces of marble found in archaeological digs from broken sarcophagi and loculi in the catacombs. There are several with Christian symbols such as a dove, olive branch, praising figure and crosses. The church was closed so we did not enter this time. 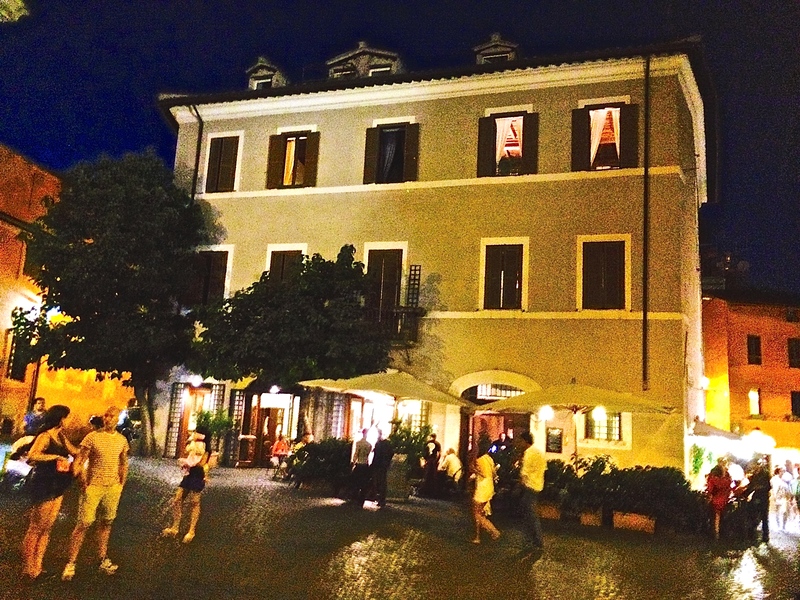 This piazza is a place where it is more fun to hang out in the dark than during the day. Although you are never alone, the mellow feel is very relaxing. The large fountain in the center provides seating on the steps. We passed the trattoria Grazia & Graziella, surrounded by tables of things to buy from colorful scarves, jewelry, leather goods and little glowing objects that jet through the night sky. Our evening ended later than we had intended. 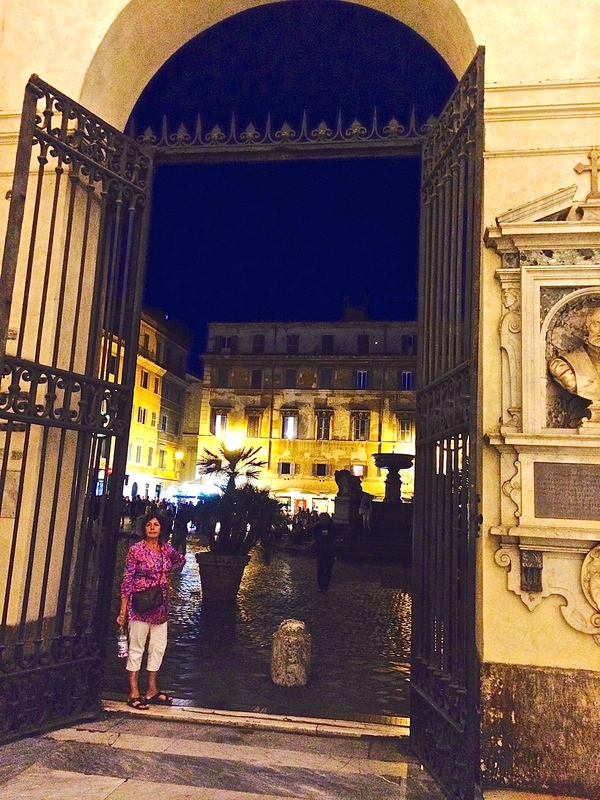 It is so easy to get swallowed up in Trastevere, and I never feel like I’ve had enough. The crumbling buildings with fading paint quickly become a welcome sight. Since it is so walkable from the city center, I bid my friends’ goodnight til the morning and slowly followed the Tiber River north to my comfortable little room by Castel Sant’Angelo. All was peaceful in the Eternal City. I fly out in two weeks. We’re staying just outside of Rome in a castle…. must do some research! Rome is such a beautiful city! I love Trastevere from the okd bridge on the ruver to the narrow streets. I walk all around it and get lost. It is wonderful. When I want To leave, I use the GPS on my phone to get me out. Anyone visiting Rome, should not miss Trastevere. And the Jewish artichokes are amazing! Brings back fond memories. 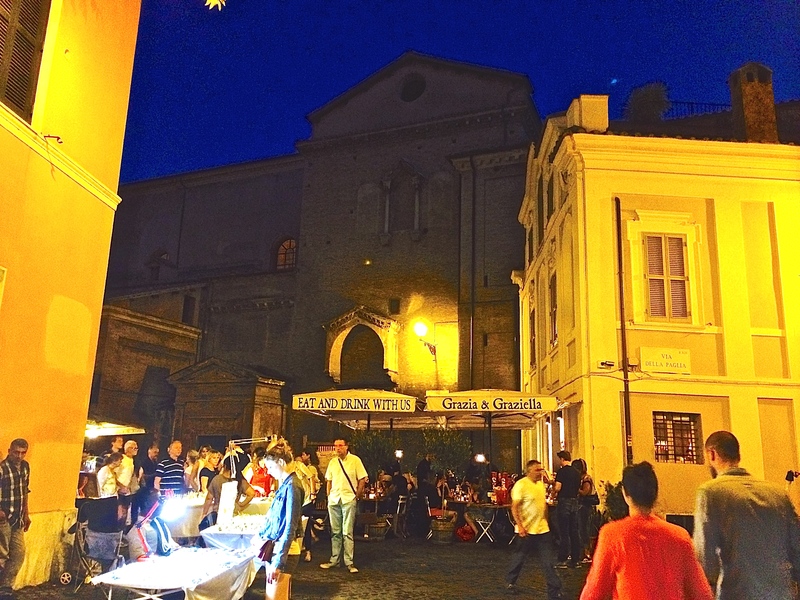 Trastevere is very vibrant and busy. One of my favourite areas in Rome! I love getting lost down the little streets. A wonderful first night in Rome. I really enjoy the Trastevere area of Rome. We ventured there a few years ago and wandered through the small alleyways. 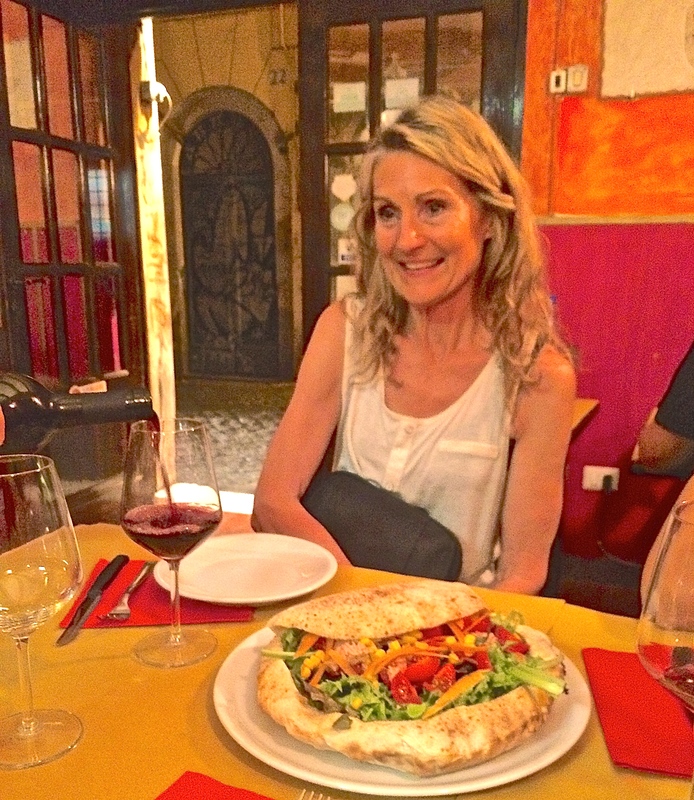 We found a great restaurant and experienced this magical spot in Rome! Did you know that Raphael’s model, Margarita, lived in Trastevere? 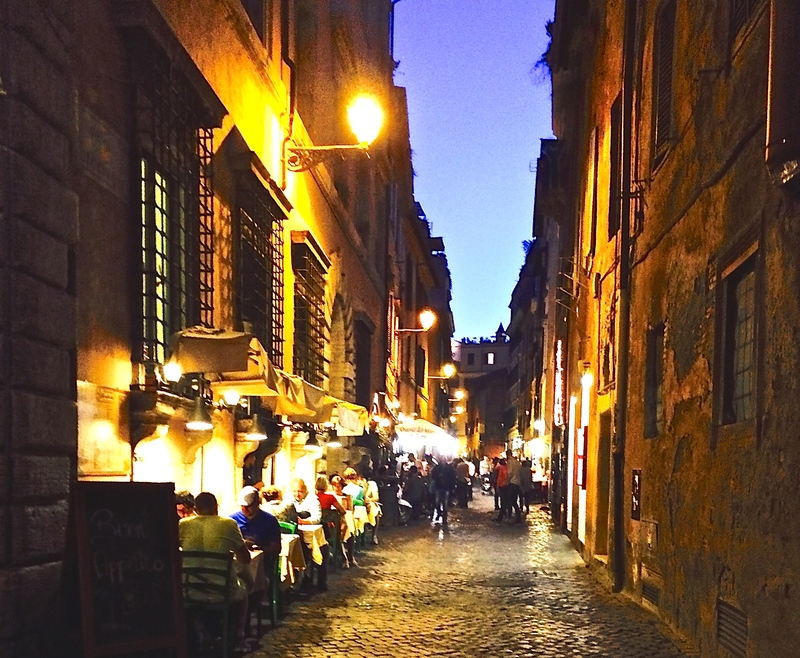 There is a wonderful historical fiction book called The Ruby Ring which brings the old Trastevere neighborhood to life! You’d probably enjoy it as you can trace your steps in the book!! Thanks for a great post! Thank you for your input!! Yes, I was aware that Raphael’s model Margarita lived in Trastevere, but have not heard of the book. I will have to look into it:) Thank you! You got that right! I love the ambience of Trastevere. 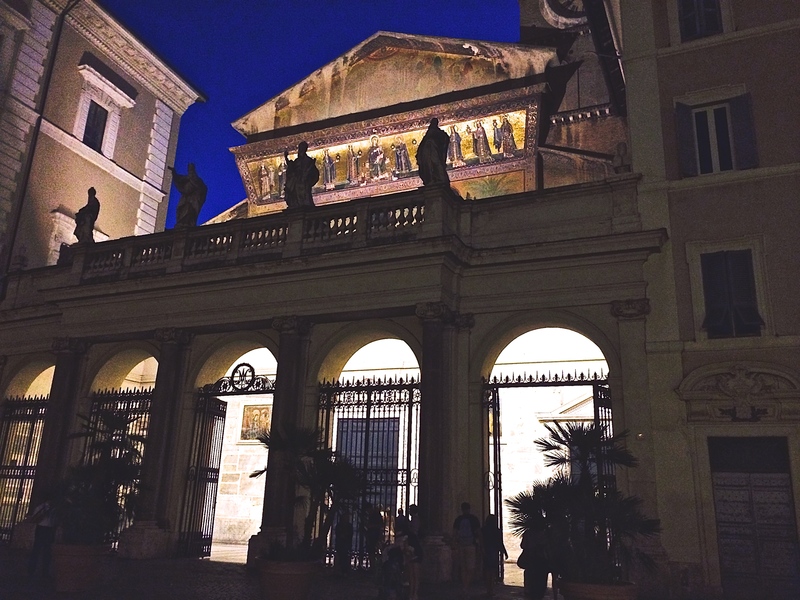 Trastevere – – – my Roman hubby’s favorite part of town. Wonderful job capturing the feel of the neighborhood! I am now feeling quite nostalgic for Trastevere, a great part of Rome. It sure is. I can feel that way as well from time to time. Always a great pleasure to revist! Fabulous place! I wish I were there. Now. I checked out Pizzeria Nerone’s site, and it is interesting that the video is narrated in Spanish (??). yes it is, very interesting! But didn’t it make you hungry for pizza?